How is your holiday shopping going? Are you almost done? I still have a few toys left to track down for the girls, and then finish up the stocking stuffer treats. One item that will be included in their stockings this year, will be the WOW Cup from Telebrands. "WOW Cup's auto-sealing technology allows liquid to flow only when you drink. When you're done, it automatically seals, meaning kids can roll, jump and spin and their drink always stays in! It's virtually indestructible too so when kids drop their drinks, as we know they will, not only will you NOT have to worry about cleaning anything up, you'll also know that their Wow Cup is totally unharmed no more messy clean ups! Just fill, twist and sip." I am not usually one who jumps at products seen on television late at night, but after seeing an infomercial about the WOW Cup, I was intrigued. Both of my girls are transitioning away from sippy cups, but still are not ready to drink from a big person's cup, as they still like to tilt the cups back to much or don't hold the cup with two hands and drop it. While I could rely on sippy cups to prevent spills and messes, I do want to help transition them to a big kid's cup, and think the WOW cup is just the answer. Upon receiving, my girls really helped me put this cup to the test. I can't tell you how many times they dropped the cup, which was full. Not only did it not shatter or crack, due to how well it is made. It is so durable, even when Bella threw the cup down the stairs, the lid stayed on, the drink remained inside and the cup didn't crack. Now, that was "Wow" in my books, as we have lost many a sippy cups and bottles when the girls were rough housing and would throw them like this. Usually, I don't like to bring drinks in the car for the girls, or offer them up unless we are sitting at a restaurant, as they always seem to leak onto their car seats, my car's interior, or wind up all over the floor, leaving the car mats and rugs a mess, and a pain to clean. But, now thanks to the dishwasher safe WOW cup, which really is "WOW", the girls can enjoy a cold drink on the go, and I don't have to worry about any spills or messy cleanups. My girls are so proud of themselves now that they have said goodbye to their sippy cups, and reach for the WOW cup whenever they want a drink. 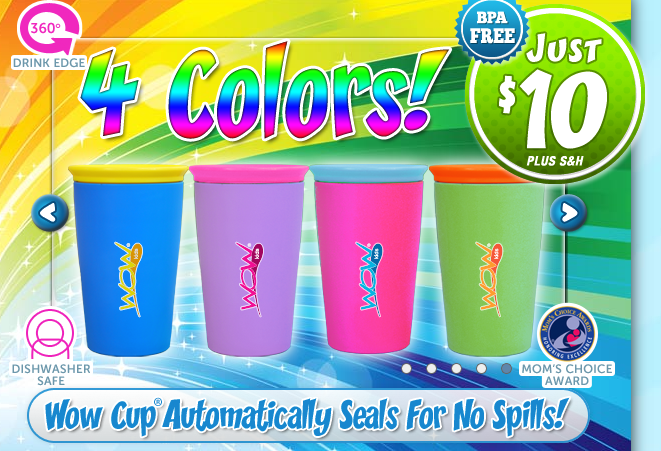 The WOW cups come in four bright colors -- blue, pink, green and purple, making them great for both boys and girls to enjoy and carry around. I can't wait to see the girls' faces when they wake on Christmas morning to find a new WOW cup in their stocking. Right now, we have only had the one I was sent to review to use, and the girls really don't like to share. They will love having their own cups, in their favorite color. And, with the price being only $10 plus s/h, you can't go wrong. I also picked up a couple extras to leave at my parent's house for the girls to use. To learn more about the WOW Cup, or to place an order online, visit http://www.wowcup.com/. Want to win a WOW Cup for your child? I am excited to offer three (3) lucky readers the chance to win one of these cool drinking cups for kids, thanks to the vendor. To enter, please complete the entries on the Rafflecopter form below. Good luck!